Sarah's maiden name isn't Gross, it's Tate. You can find this on her marriage license dated Jan. 29, 1860 Grundy county Tennessee, and 1850 Census Record, which she is living with [grandparents?] John and Sarah Gross. "Who were Sarah Ann's parents"? We know that they are kin to John and Sarah Gross, two of the bibles that are descended from M.V. and Sarah state that her father was Jackson Tate and her mother was Sarah Gross daughter of John and Sarah Gross.... We can not find any records for Sarah Ann before she married M.V. other than 1850 Census record for Grundy County Tennessee and 1860 Marriage license. Martin Van Buren Dykes b.6 May 1839 Warren County Tennessee, he is the son of Sanders and Almira Jane Walker Dykes. Martin died 16 Sept. 1932 and is buried at Stockdale Cemetary in Wilson Co. Texas. He isn't far from Olley. Sarah Ann Tate b. 1 Sep. 1844 Grundy Co. Tennessee, and died 25 Nov. 1889. She is buried in Martindale Cemetery, Caldwell County Texas. I have pictures of both her and M.V. tombstone, and also Olley and her husband. I think that I have a picture of Sarah Ann Tate and M.V., but without any one else having one and being able to compare, well I'm just not sure. I was hoping that some one on the Culpepper side might have one, since M.V. lived with the girls before he died. E-mail written 2001,2003 to Lew Griffin from Linda Eddleman Ruiz, e-mail address. Martin Dykes, Father-in-Law, M, 78, WD, TN TN TN. Wilburta L. Culpepper, 23 Apr 1927 - 2 Jun 1994, Wife of Claude B. Culpepper, Interred 3 Jun 1994 in Ft. Sam Houston National Cemetery, Section 10, Site 1447. Claud B. Culpepper, Son, M, 7, S, TX TX TX. Cornelius V Culpepper, Male, Single, died 5 Aug 1972 in Bexar Co., TX. Lois Francis Culpepper, Female, died 24 Mar 1985 in Bexar Co., TX. Wilburta Louise Culpepper, Female, died 2 Jun 1994 in Comal Co., TX. Claude Brotherton Culpepper, Male, died 14 Apr 1998 in Comal Co., TX. Wilbur Glenn Culpepper, Male, born __ 1946 in Bexar Co., Texas, child of Claude Brotherton Culpepper and Wilburta Louise Bacon. Clyde Bert Culpepper, Male, born __ 1948 in Bexar Co., Texas, child of Claude Brotherton Culpepper and Wilburta Louise Bacon. Sandra Lea Culpepper, Female, born __ 1955 in Bexar Co., Texas, child of Claude Brotherton Culpepper and Wilburta Louise Bacon. Weta Culpepper, born 23 Oct 1909 in Uvalde Co., Texas. James O’Conner, Hiredman, M, 27, S, MO MO MO Herder-Goats. Biography* � In a 28 Jul 1978 letter, Joyce wrote that she is a librarian at Lackland Air Force Base. Joyce added that she has been writing a "Family Journal" for about ten years which was to be an account of her mother's family as well as the Culpeppers. In the process Joyce has copied Bible records and cemetery records for her family which she has been kind enough to share. Joyce noted that she was also a "would be" artist and writer. Joyce has been listed in the 5th edition (Great Britain 1968) of International Biography in the 1st edition (1969) of Two Thousand Women of Achievement in the 8th (1975 - 1975) and succeeding editions of Who's Who of American Women in the 14th (1975-1976) and succeeding editions of Who's Who in the South and Southwest and also in Who's Who in America.
? Culpepper, Dau, F, 3 ?/12, S, TX TX TX. Iva J. Culpepper, Dau, F, 1 9/12, S, TX TX TX. Effie Culpepper, 25 Sep 1884 – 1 Feb 1968. D. I. Culpepper, died 28 Nov 1948 in Bexar Co., TX. Elfie M Culpepper, Female, Widowed, died 1 Feb 1968 in Bexar Co., TX. E-mail written 2005-2009 to Warren L. Culpepper from Patricia Francis La Scuola (#20064), e-mail address. 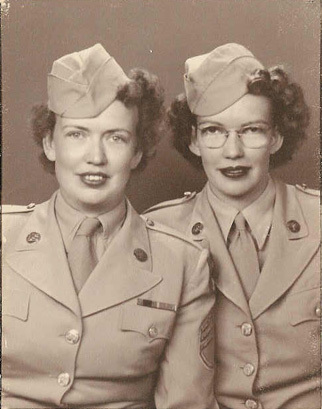 (Both Iris & Lucy enlisted in the Women's Army Corps (WACs) but later became WAFs (Women's Air Force). In both pictures, Iris is on the left and Lucy is on the right. Biography* � Mrs. Joyce (Culpepper) Organ wrote 28 Jul 1978: Iris Inez is a Dr (Honorary) and Vice President of the Church of Cosmic Science in San Jose, Calif. She is a lecturer and healer (not the spectacular kind). Was born a curly-haired, blue-eyed blond, and began singing at an early age. Had her own program on the Voice of America when she was stationed with the Army of Occupation in Germnay. Sang at all special services when in Almagordo, New Mexico, and directed and sang in a WAF chorus while in Tokyo. Has now retired from Lockheed's Sunnyvale Plant (where our spy satellites are produced, only she did not tell me this. I found it out from a book by Peter Klass). Since her retirement she has bought and learned to run a printing press, which she uses for her church. E-mail written 22 May 2005 to Lew Griffin from Fay Hendrix, e-mail address. 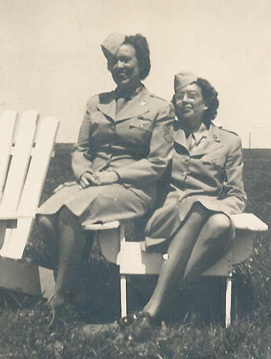 Iris I Culpepper, White, born 1914 in Texas; Resides in Bexar Co., TX; Enlisted 6 Apr 1943 at San Antonio, TX in the Womens Army Corps as a Private; Education: 4 years of high school; Occupation: Clerk-Typist, Single; Height: 58 in., Weight: 95. Lucy M Culpepper, White, born 1916 in Texas; Resides in Maverick Co., TX; Enlisted 29 Apr 1944 at San Antonio, TX in the Womens Army Corps as a Private; Education: 4 years of high school; Occupation: General Clerk, Single; Height: unk, Weight: unk. Iris Culpepper, died 9 Aug 1999 in Atascosa Co., TX. Correspondence from Joyce Culpepper (Mrs. R.) Organ to Lew Griffin, 28 Jul 1978. Iva Jane Culpepper, Female, born __ 1928 in Uvalde Co., Texas, child of D. I. Culpepper and Elfie Spencer.